What do I feed my rabbit? Important note: Rabbits have sensitive stomachs! Should you decide to change the dry food to a different type/brand please make it a gradual process over a period of at least two weeks, for younger rabbits I would suggest leaving a change of diet until they are over 12 weeks of age. The same applies to green foods which should only be introduced in small quantities to start with. My personal preference is to feed pellets, as these are manufactured to provide the rabbit with a balanced diet. Mixed rabbit food can pose a problem for a fussy eater who will only pick out the bits he likes which will lead to an unbalanced diet. A good pellet should be hard with little dust. I always try to mix some of the old batch in with the new so as to avoid any mild stomach upsets due to any variances in the manufacture of batches. A rabbit’s digestive tract is designed for a diet high in fibre and low in protein and carbs. Young and growing rabbits should be freely fed. 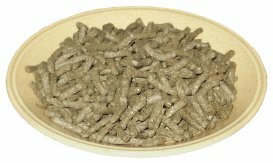 Pellets are easy to store, preferably in a good quality container away from damp and vermin. As a treat I like to bake hard some fresh brown or wholemeal bread to offer the rabbit. Listed below are various hay types and their contents in order protein/fibre/calcium. You should offer fresh hay daily for roughage, also a good source of vitamin D (essential for good bone growth) and essential to aid the proper movement of the digestive tract. Straw may be offered as an alternative to hay, it is slightly higher in roughage, lower in protein content and roughly the same for calcium (barley being the best) The long fibres assist in pushing along the pellets and indigestible items like fur etc. Fresh hay is also particularly good in the summer if periods of excess heat cause the rabbit to eat less of his pellets. In the wild a rabbit would spend seventy per cent of its day grazing, dusk and dawn usually being its most active feeding times. So a good supply of fresh sweet smelling hay will help digestion, reduce boredom, behavioural problems and help maintain healthy teeth. Must be freely available and replaced daily with a fresh supply. A bottle with a ball-bearing in the nozzle serves as the best receptacle. Tip: Do not completely fill the water bottle in sub zero temperatures, if the water freezes it will split the bottle. The best form of ACV is the (cloudy in appearance) organic non-pasteurised type. The healthy benefits come from the 'mother' a cobweb like substance and pectin. When a rabbit is suffering from stress the pH in its intestines become more alkaline, this encourages the likes of e.coli to get a hold. 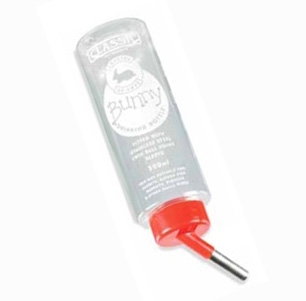 By adding ACV to your rabbits water at 1 teaspoon per litre you will help your rabbit to maintain a healthy balanced gut. It is also said to increase appetite and help provide extra energy at times of higher activity. These provide a good source of vitamins, especially A, B and E.
Vitamin A, found in abundance in carrots and kale, is required for body growth and a lack of it may make a rabbit more susceptible to some nervous disorders. Very good sources of Vitamin B are found in whole grains and spinach. A lack of Vitamin E can cause fertility problems in breeding does. 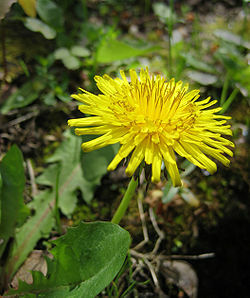 Good levels of vitamin E are found in spinach and dandelion leaves. Very good sources of Vitamin K are found in sprouts, carrots and asparagus and as such are useful in the prevention of mange and other similar disorders. It should be noted that although Spinach is a good source for many vitamins it should only be offered in small quantities, say a handful, no more than once a week. Avoid the darkest leaves as they contain more calcium oxylate and this can cause bladder sludges and the human equivalent of kidney stones. Of course all of these vitamins will be found in a good quality pellet feed. 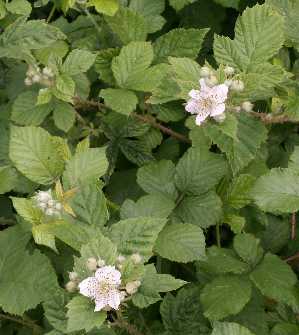 Fresh wild green foods gathered from uncultivated areas must be viewed with caution. There is always a concern of poisoning your pet which may result if the plants have been sprayed with herbicides/pesticides. If you are sure the items you gather are safe of weed killers etc then below are a few suggestions with identifying pictures some of which also have a medicinal purpose. Remember to always wash and check any vegetation to be fed to your rabbit, making sure there is no rot, disease etc that would upset their stomachs, particularly young rabbits. One word of warning, if you are in any doubt about the vegetation then do not pick it. 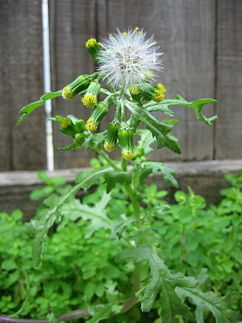 The plant may be poisonous. There are also many cultivated greens and root vegetables which are useful as a supplementary feed and titbits. Of the root vegetables or their peelings carrots, swede and turnips are good. Do not over-do it as too much fed to young rabbits (under three months) may suffer stomach upsets. I find it best to offer a little but also give hay at the same time. Carrots, their peelings and the tops are sweet and easily digested by rabbits of all ages but do have a high water content, so only feed in moderation. Cabbage, Brussel Sprouts etc are readily taken by rabbits but an excess could cause diarrhoea, so again I'd advise only offering a little and either mixing it with other greens or hay. 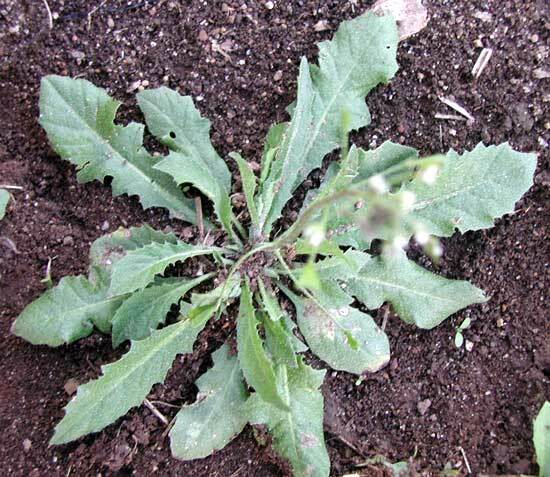 Chicory is an excellent feed and if fed regularly you will notice your stock developing a lovely glossy coat. Iceberg lettuce has no nutritional value and in my opinion is best avoided as it has a very high water content and can upset the rabbits' stomach. Dark leaved lettuces are fine in moderation. Parsley is said to aid the urinary tract, the roots useful for constipation or bowel obstructions and enrich the blood. Oregano to aid digestion is an excellent antioxidant. Some buy expensive additives but a cheaper option is to buy the oil of wild oregano and add 0.2ml per kg of rabbit weight to water when required. The stalks of cabbage, cauliflower etc offered in sensible sized portions makes for a good chew, although of little nutritional value. Of fruit the most favoured are apples (remove the seeds), grapes, peeled oranges and bananas, but remember these are high in sugar content and should only be given as a treat. 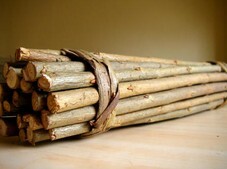 The twigs of various trees and shrubs are useful to help curb boredom for your rabbit or the hutch being chewed. Gnawing on twigs or untreated softwood also helps to keep his teeth in good order. Select a twig from this list of safe woods: apple, ash, birch, blackberry, hazel, hawthorne, raspberry and willow. Alternatively you can purchase chews like willow balls, soft wood toys and so on if you are unsure what these trees and shrubs look like.